After voting last month in favor of a proposed law banning mental health professionals from trying to make gay youth become heterosexual, State Rep. Colin Larson (R-Littleton) “didn’t get any backlash” from his district, despite that fact that the vast majority of his fellow Republicans voted against the legislation. “I didn’t have any constituents reaching out and saying, ‘What are you doing? You’re betraying me,'” Larson told the Colorado Times Recorder after he spoke a news conference today, organized by supporters of the bill. “If anything, I’ve gotten kudos,” he said, emphasizing his view that GOP opposition to the bill is rooted in generational differences that are fading. Larson, who’s the youngest statehouse member, said their’s a “disconnect” between the views of ordinary Republicans and the stances of GOP lawmakers at the Capitol. “My colleagues have a perception that there’s this groundswell of opposition that’s actually a small minority of folks,” he said. 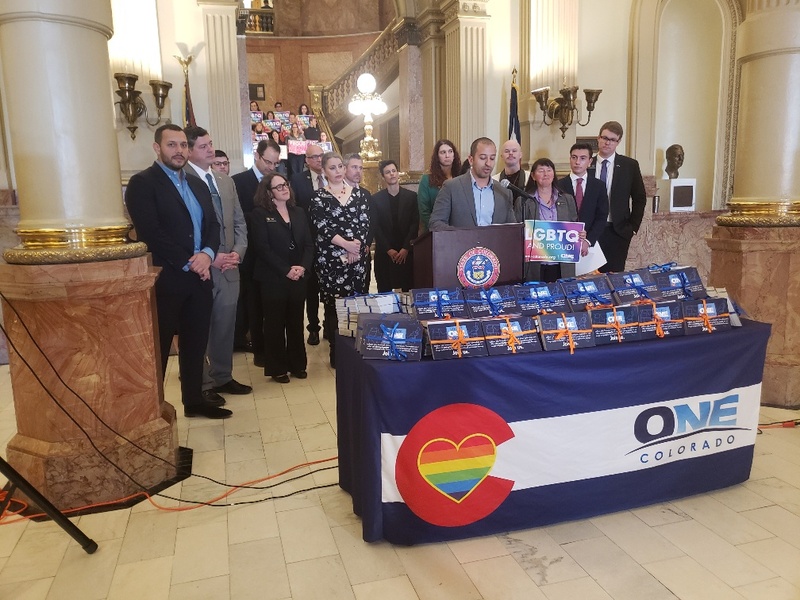 “With pro-equlality majorities in both the house and the senate, and a pro-equality governor, this is the year that Colorado sends the message to LGBTQ youth that they were born perfect and should be affirmed for exactly what they are,” said Ramos. Republican opponents of the conversion-therapy ban mostly emphasize that it should be up to parents, not the government, to make decisions about therapy for their children. The bill’s advocates emphasized that conversion therapy is opposed by major mental health professional associations. “Through the testimony I have heard, year after year, of heartbreaking feelings of being rejected by your families and by those who are supposed to love you, we know that this practice is tantamount to child abuse,” said Colorado State Rep. Dafna Michaelson Janet (D-Commerce City) at the news conference. Today’s news conference took place prior to a state senate hearing on the conversion therapy ban. “I implore the committee members today to vote in a decent and ethical way and putting an end to the cruel and inhumane practice of conversion therapy,” said Johnny Hultzapple, a South High Student at the news conference. Hultzapple got national attention for his Facebook post denouncing a conversion-therapy program launched last month by Denver Archbishop Samuel J. Aquila. if families want to do "conversion therapy," we probably need to let them. If churches want to do "conversion therapy," we probably need to let them, too. But no one licensed by the state should be authorized to perform an ineffective and harmful procedure. Larson is my representative. He actually ran and beat a RWNJ in his primary. From what I know, he's an improvement over his predecessor.